More than 80% of family businesses and 60% of small businesses have no succession plans in place. This means most of the nation’s small companies could be totally upended by a retirement, career change, death, incarceration, or other life-changing event. According to a study by Dr. David Paradise, who researches small and family businesses, the top reasons for a lack of a succession strategy include poor internal communication, lack of planning skill, emotional struggles, and an inability to foster conflict resolution. But these issues don’t have to threaten your small business. 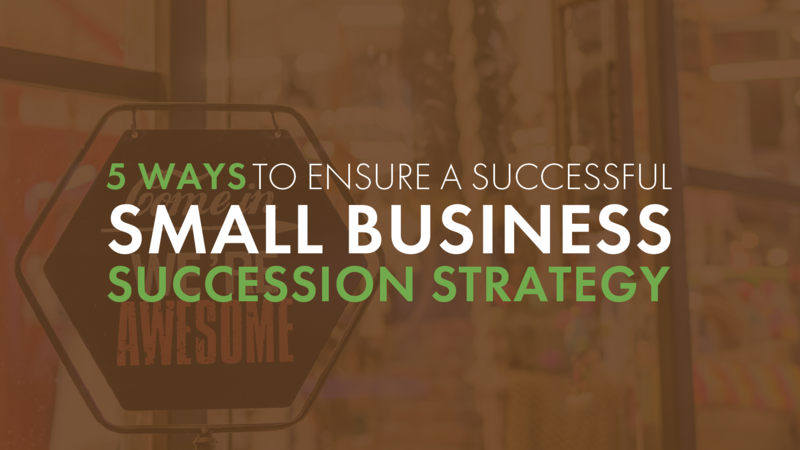 To create a successful succession strategy, work with an Oklahoma small business coach and take the following steps. Forbes magazine looked at how retirement affects succession planning and found that approximately 10,000 baby boomers retire every day. They also found that until the final days before retirement, most business-owner baby boomers can’t articulate their succession plan. When asked, most retiring business owners only have vague answers about what will happen next - like they plan to sell the business but don’t know who will buy it, or hope a family member will step in but aren’t sure. These vague plans can lead to chaos for the company. To combat this, create a retirement calendar for all top executives in the organization. Set a target retirement date for each person - even if it’s just a guess - and build backward from there, noting milestones like 1 month, 3 months, and 1 year until retirement for each person. This will build a realistic retirement picture, so you can plan more effectively. Next, develop a transition plan for having the right people in the right place at the right times, no matter what happens. So if Jane Jones’ retirement date is January 1, 2021, the company can plan to train Stan Smith during the entire year of 2020 in preparation to replace her. The same goes for replacing people who simply leave the company to pursue other work. Could your company handle a top executive giving just 1 week of notice, or no notice at all? A succession plan can tell you what to do next in this urgent situation. Keep in mind that each line of succession should have more one person who is next-up, in case the situation changes rapidly and you need a backup to your backup. In fact, having a limited number of backup options when successors leave is one of the top reasons succession plans fail. Determine your successors and list them in priority order. Create what-if scenarios that will help the company adapt, even if several successors leave at the same time. Another way to ensure your succession plan is successful is to view it through the lens of the future, not the present. For example, if the company is likely to buy out a competitor within the next 6 to 12 months, the succession plan should be updated to take this into account. This is particularly important if you have locations spread across a wide geographic area. When a company suddenly needs a successor to step up, the person’s family might not be able to move on short notice. Develop a plan that includes short/long term options for remote work and commuting. Poor communication is the fastest way to kill a great succession plan. It’s amazing how many companies create succession plans without even telling the successors what the company has in mind for them. When the time comes, everyone is surprised to find themselves scrambling. As you create your plan, notify everyone involved about their proposed succession role. Solicit their feedback and incorporate it into the plan. This means there will be no surprises and everyone involved can work as a team to evolve the structure of the company over time. Does your company already have a succession plan in place? If not, look for an Oklahoma small business coach who can help guide the process. Ascension CPAs & Consultants is a full-service business coaching company that improves financial forecasts through accounting, bookkeeping, payroll, taxes, planning, and CFO services. We can reduce the tax burden your company faces and provide business consulting services with a personal touch.